With great barbecue joints, fine restaurants, all-you-care-to-eat buffets, places to grab burgers or pizza, you can spend a lot of time feeding yourself in Branson. And while the old adage holds true, it’s better to give than receive, that doesn’t mean you should be spoon-feeding someone at a restaurant – unless you’re the parent of a toddler. Instead, share a bite with Branson’s feathered and fishy residents. Unlike that guy at the adjacent table, they don’t mind being fed by strangers. While you’re there, feel free to utilize the park’s horse-shoe pits, boat docks, benches, and grassy area to relax and spend the morning or afternoon. Another great place to make friends from the animal kingdom is Shepherd of the Hills Fish Hatchery, where thousands of trout are raised before being released into LakeTaneycomo and Missouri’s other trout streams. Located just below Table Rock Dam, a highlight of any visit to the Hatchery is walking among the runways, handfuls of fish food in hand, and watching the trout jump and splash en route to the tasty morsels thrown their way. 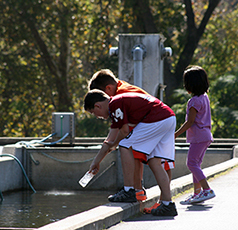 If you’re traveling to the Hatchery with children, don’t forget a handful (or full roll) of quarters to buy fish food. Once the kids get started, they won’t want to stop. With so much to see and do in Branson, it’s sometimes easy to overlook these kinds of experiences. But take a few minutes to enjoy these simple and fun outings the next time you’re in town. The ducks, geese and trout will be glad you did – and you will be too. Learn more about all Branson has to offer at ExploreBranson.com.